Our Vic notched up a most impressive victory to give Timmy Murphy a memorable hat-trick when partnering David Pipe's charge to win the bet365 Charlie Hall Chase at Wetherby. Sent off at 6-1, the David Johnson-owned eight-year-old was always travelling smoothly towards the head of affairs and jumped to the front at the fourth-last. Once assuming command, Our Vic moved readily clear of nearest pursuer Neptune Collonges, who stayed on dourly under Sam Thomas to chase him up the home straight. Pipe's charge jumped well throughout the contest and only had to be pushed out to record a thoroughly convincing seven-length success over the 2-1 favourite. Kingscliff made much of the running but tired markedly in the latter stages, allowing stablemate Sir Rembrandt to take third place, a further five lengths away. Pipe, landing his first major success since taking over the licence at Pond House from his father Martin, told Channel 4 Racing: "People have questioned his stamina, but he's bred to get six miles and he proved it today. "He was always going well up the home straight, but as we know in the home straight here there's four fences and in soft ground it's a long way. "Timmy gave him a fantastic ride and it's brilliant for the yard. It's great for me, great for David Johnson and great for everyone who has supported me." Champion jump trainer Paul Nicholls is keeping a close eye on the weather before deciding whether to run either Star De Mohaison or Neptune Collonges in the £90,000 Grade Two bet365 Charlie Hall Chase at Wetherby on Saturday, October 28, which today has attracted a superb 20-strong entry. Star De Mohaison, whose wins last season included the Grade One Royal & SunAlliance Chase at the Cheltenham Festival, prefers decent ground, while Neptune Collonges, a three-times Grade Two scorer over hurdles, including in the Brit Insurance Novices’ Hurdle at Wetherby in February, relishes a soft surface. “I intend to run either Star De Mohaison or Neptune Collonges in the bet365 Charlie Hall Chase on Saturday. They wouldn’t take each other on because they both want different ground,” explained the Ditcheat handler this afternoon. “Star De Mohaison has done very well since last season. We’re very pleased with him and he looks in good form, but he would not want it soft. “Neptune Collonges is also in good order, and we would want it to keep raining for him, as he loves it testing. A cracking entry for the bet365 Charlie Hall Chase includes Ollie Magern, Kingscliff and Take The Stand, who filled the first three places in last year’s renewal, as well as the likes of Our Vic from the David Pipe yard, and the Phillip Hobbs-trained pair Monkerhostin and Lacdoudal. The one Irish entry is the Michael Hourigan-trained Church Island, a Grade Two winner at Navan last season. The seven-year-old has already tasted success on these shores, having captured a novice chase at Cheltenham in November last year, when defeating Celtic Son by eight lengths. Hourigan declared today: “Church Island has a few options, but I think I’m favouring a crack at the bet365 Charlie Hall Chase at Wetherby. “Things did not really go his way after Christmas, and he was a bit unlucky when unseating twice, but he’s in top form now. He looks to be a much improved horse this term. The Grade Two bet 365 Charlie Hall Chase (3.25pm) forms part of a cracking seven-race card at Wetherby on Saturday, October 28, the second of two excellent days racing at the Yorkshire track. The other highlight on the Saturday is the £40,000 Grade Two John Smith’s Hurdle (2.50pm), which has attracted 12 high-class entries. The contest could witness a fascinating clash between the hugely exciting Black Jack Ketchum, unbeaten in seven starts, and World Hurdle hero My Way De Solzen. The going at Wetherby is currently good to soft, soft in places, and the forecast is for unsettled weather with a little rain during the week. Admission prices for Friday, October 27: Premier Enclosure £19; Paddock Enclosure £12; Course £4; Pick of the Paddock (advanced only) £16; Cars to Course (incl. four adults) £14; OAPs to Course £2; Children under 16 (accompanied by an adult) are admitted free; Coach and car parking is free. Admission prices for bet365 Charlie Hall Chase day, Saturday, October 28: Premier Enclosure £26; Paddock Enclosure £15; Course £5; Pick of the Paddock (advanced only) £19; Cars to Course (incl. four adults) £17; OAPs to Course £2.50; Children under 16 (accompanied by an adult) are admitted free; Coach and car parking is free. Wetherby Racecourse holds its first major raceday of the season on Saturday, October 28, when the highlight of a cracking seven-race card is the £90,000 Grade Two bet365 Charlie Hall Chase (3.25pm), an established early season target for potential Cheltenham Gold Cup contenders. Gold Cup fences in front of Sir Rembrandt. The fantastic programme, which forms the second day of the two-day bet365 Charlie Hall Meeting (Friday, October 27 & Saturday, October 28), also features the £40,000 Grade Two John Smith’s Hurdle (2.50pm), the £25,000 Listed Weatherbys Bank Handicap Chase (2.20pm) and the opening £20,000 Listed Constant Security Wensleydale Juvenile Novices’ Hurdle (1.45pm). Bet365 has sponsored the past three renewals of the prestigious three mile, one furlong bet365 Charlie Hall Chase, and this year the betting company has generously boosted the prize fund to £90,000, a tremendous 20% increase on the £75,000 on offer in 2005. The bet365 Charlie Hall Chase could see the return of the Jonjo O’Neill-trained Iris’s Gift. 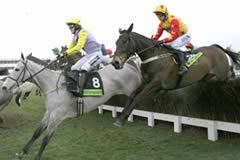 The nine-year-old grey was the excellent winner of the 2004 Grade One Ladbrokes World Hurdle at the Cheltenham Festival but things did not go his way in the second half of last season after notching a hat-trick of victories in his first three novice chases. O’Neill revealed today: “He’s ready for the bet365 Charlie Hall Chase and he’ll go there all being well - so long as the ground is right. “It didn’t go to plan last season but that’s typical with good horses, you have good seasons and bad seasons with them. He was unfortunate in most things that happened last year and it didn’t work out for him. 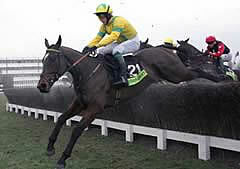 The bet365 Charlie Hall Chase has a distinguished history and recent winners include the great Gordon Richards-trained One Man, who scored back-to-back victories in 1996 and 1997 under Richard Dunwoody, while Cheltenham Gold Cup hero See More Business took the Wetherby prize in 1999 and 2000. The hugely popular Howard Johnson-trained Grey Abbey captured the 2004 renewal on his first start after taking the previous season’s Scottish Grand National, while last year saw the Nigel Twiston-Davies-trained Ollie Magern defeat a high-class field that included subsequent Grade One Betfair Chase winner Kingscliff and 2005 Cheltenham Gold Cup runner-up Take The Stand. Trainer Robert Alner has again picked out the bet365 Charlie Hall Chase as the ideal race to begin Kingscliff’s campaign, while Paul Nicholls has mooted the possibility that his superb Grade One Royal & SunAlliance Chase hero Star de Mohaison could return to action in the Wetherby showpiece. The Grade Two bet365 Charlie Hall Chase and the Grade Two John Smith’s Hurdle form part of the BHB’s Order Of Merit, which was won in 2005 by the Howard Johnson-trained Inglis Drever, who went on to capture the latter contest on his seasonal bow last year. 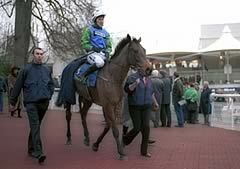 Inglis Drever, the champion staying hurdler of the 2004/2005 season is typical of the calibre of horses that contest the three mile, one furlong John Smith’s Hurdle, which could see an exciting seasonal debut for the sensational Black Jack Ketchum who is unbeaten. The seven-year-old enjoyed a phenomenal 2005/2006 season with five wins including imperious victories in the Grade Two Brit Insurance Novices’ Hurdle at the Cheltenham Festival and the Grade One Citroen C6 Sefton Novices’ Hurdle at Aintree. O’Neill reported today: “Black Jack Ketchum is in the John Smith’s Hurdle at Wetherby and we’re looking forward to that. He’s in great form and hopefully he stays in good form until then. “He’s a very exceptional horse - probably once in a life-time really. Our main worry is keeping him sound because we know how good he is. It’s just a matter of keeping everything right and happy for him. I’m really looking forward to running him to be honest. Alongside Black Jack Ketchum, this year’s running of the John Smith’s Hurdle appears set to attract another high quality field with the Henry Daly-trained Mighty Man a possible, and Alan King eyeing up a challenge with Grade One Ladbrokes World Hurdle victor My Way De Solzen. High-class winners in recent times include the Mary Reveley-trained Cab On Target (1991 and 1995), Trainglot (1996), Pridwell (1998), who went on to conquer the great Istabraq in the following spring’s Grade One Martell Aintree Hurdle, Silver Wedge (1999), and the Mouse Morris-trained dual winner Boss Doyle (2000 and 2001). The seven-race card on Friday, October 27, day one of the bet365 Charlie Hall Meeting, commences at 1.20pm and is sponsored exclusively by bet365. The feature event of the day is the £13,000 bet365 White Rose Handicap Chase over two miles, which was won last year by the Martin Todhunter-trained Provocative. The two-mile bet365 Beginners’ Chase (2.25pm) saw a fine performance last season from the victorious Albuhera who defeated Rebel Rhythm by four lengths and went on to win the Grade Two Dubai Duty Free Fulke Walwyn Novices’ Chase at Newbury, while the bet365 National Hunt Novices’ Hurdle (4.45pm) was won by Nor’Nor’East in 2005, who went on to land the williamhillpoker.com Handicap Hurdle at Sandown in December. With the bet365 Charlie Hall Chase Meeting less than two weeks away, Chief Executive and Clerk of the Course James Sanderson reported today: “The going is currently good and, while anything can happen in terms of the weather before our next meeting, I am very happy with the condition of the ground at present. We are forecast a drop of rain later this week which will be perfect. “The bet365 Charlie Hall Meeting is always a great occasion with fantastic racing. I am looking forward to seeing some of the best three-mile chasers crossing swords in the bet365 Charlie Hall Chase, which is a proven pointer to the Cheltenham Gold Cup and this year carries record prize-money of £90,000.